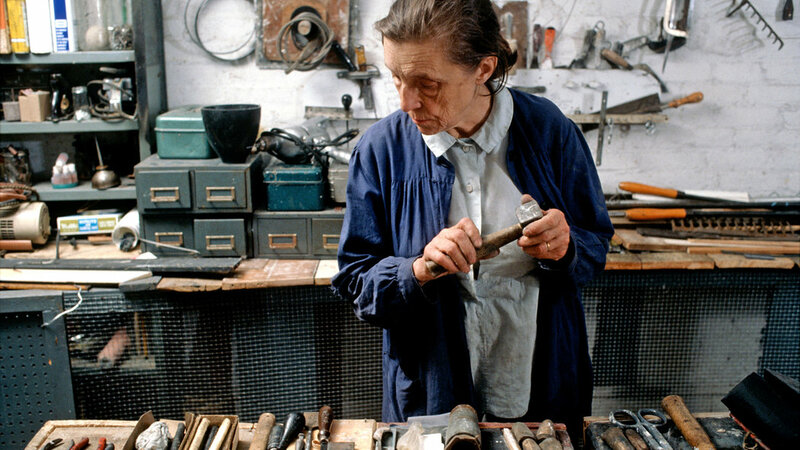 Louise Bourgeois in front of STE SÉBASTIENNE in her Brooklyn studio (1993). Photo: © Vera Isler, © The Easton Foundation/VAGA, NY. Louise Bourgeois is best known for her haunting, deeply personal art—but few realize that the beloved French sculptor was as prolific a writer as she was an artist. When she died in 2010, Bourgeois left behind shelves packed with diaries and boxes brimming with sheets of paper marked in her elegantly precise cursive. Now, eight years after her death, her foundation has decided to begin sharing her writing with the world. The first peek will come next month, when a survey exhibitionof Bourgeois’s work opens on May 10 at Glenstone, Mitchell and Emily Rales’s private museum in Potomac, Maryland. The catalogue accompanying the show includes nearly 50 pages of previously unpublished diary entries that the artist wrote between the ages of 14 and 91. Bourgeois’s writing feels more like a series of carefully composed poems than slapdash accounts of the day. Like her art, her words almost bubble over with longing, loneliness, and angst. The selections in the Glenstone catalogue trace her journey from a teenager living with her tapestry-restorer parents in Choisy-le-Roi to a twenty-something art student in Paris, then to a young mother, and then finally to an aging artist in New York City. Her struggles with depression are never far from the surface. Louise Bourgeois, Diary spread, May 11–12, 1994. Collection Louise Bourgeois Archive, The Easton Foundation. © The Easton Foundation/VAGA, NY. “You can sense her anxiety at an early age,” said Jerry Gorovoy, the artist’s longtime assistant and the current president of the Easton Foundation, a nonprofit dedicated to Bourgeois’s life and work. “I think she needed to write in the same way she needed to make art. She had this pathological need to record.” Near the end of every year, he recalled, Bourgeois would get a fresh diary and stick the one from the previous year on her bookshelf. She wrote almost every day. Although several books have included excerpts of Bourgeois’s writings over the past two decades, Gorovoy says the published material represents only a small sliver of her output. Her diaries, in particular, have largely been accessible only to scholars. Eventually, Gorovoy says, he would like to publish more facsimiles of the diaries themselves, which include drawings and diagrams. Pain does not frighten me aslong as it is an enrichment but I am so afraidto use my strength for nothing I feel time elapse elusiveand so fast that I am afraid. Many poems do not unfold as you might expect. A 1971 entry written on the occasion of the wedding of the former Philadelphia Museum of Art director Anne d’Harnoncourt, for example, is not a congratulatory testament to the power of love but a deeply bitter meditation on envy. Like her art, Bourgeois’s poems often refer back to unresolved memories—Gorovoy notes that this one might relate to her notorious jealousy of her own sister’s marriage. The artist also created boxes’ worth of notes, reflections, and lists when she was undergoing psychoanalysis in the 1950s. She tucked them away in a closet and forgot about them for decades; the first batch was only recovered in 2004. The public will get a deeper look at these writings in 2020, according to Gorovoy, when Princeton University Press will publish a dedicated book on the subject. Some of the materials will also be included in a catalogue for an exhibition on Bourgeois and Freud at the Jewish Museum in New York that is due to open later the same year. Louise Bourgeois’s HE DISAPPEARED INTO COMPLETE SILENCEPlate 1, (194–2005) Collection Glenstone, Potomac, Maryland. © The Easton Foundation/VAGA, NY, photo: Christopher Burke. Below, read the earliest entry in the Glenstone catalogue. Bourgeois wrote this poem on July 8, 1926, when she was just 14 years old, about Simone, one of her oldest childhood friends. Here is the dream.As in all my dreams I am an18 year-old young woman I am the most happy happyso I was leading in Paris a delicious life ofparties and pleasures. Being tied, for2 months I vanished into the country where life forme took a real turn. I frequentlywalked alone in the woods, so one dayduring one of my walks I found ina clearing an exquisite title shepherd who was aboutthe same age as I, it was Simone as a man, we talkedfor a long time and every day we would see each otherSince I was soon to go back to Paris I offered mybeloved shepherd to come along and in thebig city life with him was for mecharming and peaceful.One day one of my friends off invites us toa masquerade, right away I suggest to my frienda shepherd costume, with me coming asa shepherdess . The whole evening we dancedand we were so gorgeous that very sooneveryone noticed us. al A large circle formedaround us and we were twirlinground and round. All of a sudden the vaulted ceiling opened up andas we ascended we remained in each other’s arms untilslowly descending back to earth weended up where we first met…the ending is easy to imagine” I woke up, really this time what joyto have had this dream it seemed that for along time I had been one with Simone. 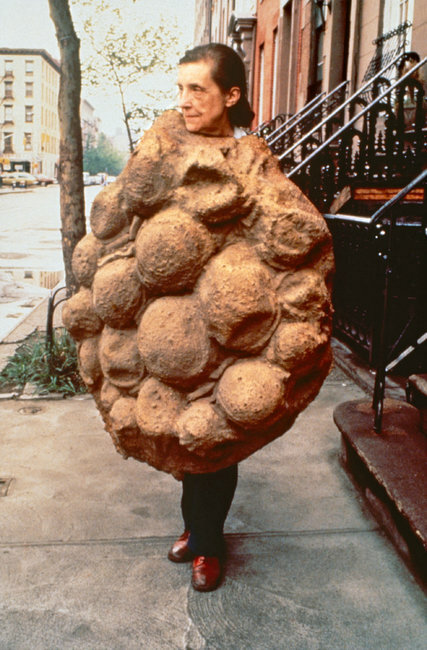 Happy birthday to Louise Bourgeois, born on this day in 1911. "Eyes" is a large marble sculpture that shows the persistence of Surrealist iconography in her late work. The eye, a recurring motif in Surrealism, served as both a symbol for the act of perception and as an allusion to female sexual anatomy. Flavorwire's list of "20 Pioneering Female Artists You Should Know” includes Louise Bourgeois, the focus of the Gallery’s latest exhibition "Louise Bourgeois: No Exit." The article contains wonderful quotes, photographs, and videos of and by the artists: http://bit.ly/1Sd4Gf4. Unlike Paris, where the homes and studios of Auguste Rodin, Eugene Delacroix and Gustave Moreau are on the standard tourist itinerary, New York has a paucity of artist’s house museums. Painters and sculptors in Manhattan have typically inhabited lofts, and when they move on, others take over the spaces. 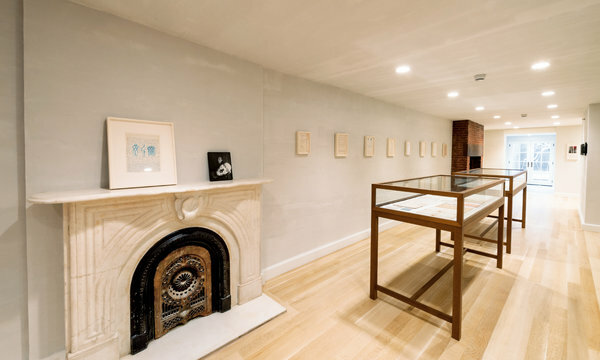 One of the few examples is 101 Spring Street, the Donald Judd house in SoHo, which is open by reservation for tours. A pristine cast-iron building, with sunny rooms that accommodate beautifully installed Minimalist art and Judd-designed furniture, it stands as a shiny, bright masculine yang. At long last, it has its corresponding yin: the recessed, cluttered Chelsea townhouse that was occupied by Louise Bourgeois. It seems fitting that the Judd house is supported by columns, and the Bourgeois home is topped by an oval skylight that is painted in the artist’s favorite aquamarine tint, a blend of Prussian blue, white and a touch of ocher. A wildly original artist, Bourgeois lived for almost half a century at 347 West 20th Street, a narrow, 19th-century brick rowhouse. A nonprofit organization, the Easton Foundation, which she set up in the 1980s, has opened the house to small arts-related groups. And this summer, the house will be accessible to the public, through tours arranged on the foundation’s website, theeastonfoundation.org. Shortly before she died in 2010 at 98, Bourgeois purchased the adjacent house from her neighbor, the costume designer William Ivey Long. It now functions as a small exhibition gallery of her work, temporary quarters for visiting scholars, and the site of a library and archive. Bourgeois purchased the townhouse in 1962 for less than $30,000 with her husband, the art historian Robert Goldwater, whom she met in her native Paris in August 1938, and married a month later. She moved with him to New York, where they raised three sons. Upon Goldwater’s death in 1973, Bourgeois drastically reconfigured the house. She moved out of their rear second-floor bedroom, leaving it and Goldwater’s third-floor library mostly untouched as a kind of memorial. She installed a single bed in the front room of the second floor. (Many years later, after arthritis had made climbing the staircase difficult, she relocated her bedroom to the front parlor on the first floor.) In her years as a wife and mother, Bourgeois had used the basement for her work. Now, she turned the whole building into an art studio. “I think from a psychological point of view, she was transforming it so radically that it was her way of dealing with extreme loss,” Mr. Gorovoy said. A psychological explanation is appropriate for an artist who demarcated her career by sharp lines of mourning. Upon the death of her mother in 1932, she turned from her studies in mathematics and philosophy to become an artist. Her mother, who restored antique tapestries in the family business in Paris, represented an ideal of care and protectiveness to Louise. Bourgeois’s iconic spider sculptures, the artist said, were an allusion to her thread-weaving mother. A seven-and-a-half-foot-high pair of bronze arachnids from 2003, “Spider Couple,” has been installed in the townhouse garden. Her father’s death in 1951 led Bourgeois to begin a decades-long Freudian psychoanalysis, and Goldwater’s death freed — or forced — her to devote herself entirely to her art. Although her husband encouraged her to pursue her sculpture, she would hold back, wanting to be a good wife. “She was very guilt-ridden,” Mr. Gorovoy said. In her late years, Bourgeois received widespread acclaim, which did not surprise her. “The art world loves young men and old women,” she told Mr. Gorovoy. Death, perhaps, trumps even old age. This fall, her sculptures were featured in the opening show of the Garage Museum of Contemporary Art in Moscow, the talked-about public gallery in Gorky Park that was founded by Dasha Zhukova and renovated by Rem Koolhaas. (The exhibition, still on view, originated at the Haus der Kunst in Munich.) A small Bourgeois show centered on a 1947 series of engravings is currently at the National Gallery in Washington. One of the spider sculptures sold at auction at Christie’s New York in November for $28.2 million, a record for a postwar female artist. And when the annex of the Tate Modern opens in June in London, Bourgeois’s work will inaugurate a series of Artist Rooms, dedicated to exploring the sensibility of a significant modern or contemporary artist. Notwithstanding her ambivalence at playing a domestic role, Bourgeois regarded herself as a domestic artist. As early as 1945, she began a series of paintings she called “Femme maison”— woman house — in which the heads or torsos of women are depicted as buildings, with openings of windows, doors and staircases. She was always interested in architectural spaces, and the rooms of 347 West 20th Street can be compared to her other artistic creations. In 1980, she obtained a large studio space, a former bluejeans factory in Brooklyn. There she began working on large installations that led to a series she called “Cells,” which she started in 1991 and continued for much of her remaining productive life. Many of the “Cells” are scaled to the size of the rooms in the Chelsea house, and they contain staircases, doors and closets, as well as some of her possessions, including articles of clothing and empty bottles of Shalimar perfume. Bourgeois had to clear out of the Brooklyn studio at the end of 2005 to make way for the Barclays Center. In her home, however, she could continue to accumulate and rearrange objects that resonated with her emotionally. “Louise never threw anything out,” Mr. Gorovoy said. At the time of her death, she retained gas receipts from her first apartment in Paris. (Aside from the personal hoarding, she kept an artist’s proof of every piece she made, from the 1940s on.) Mr. Gorovoy argues that the same spirit is visibly present in the art and the home. “The more you know the work, you can see that the way she lived is very close to what she created,” he said. It is not that behind the scenes you will discover an unknown woman, but rather, you will see your impressions corroborated. “Louise always described herself as a woman without any secrets,” Mr. Gorovoy remarked. Her life was an open house.